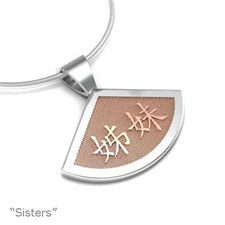 Two precious metals blend in harmony on distinctive personalized pendant. Its unusual teardrop shape is the perfect setting for artful Chinese symbols that have special meaning for you or someone you care for. Custom made to your order in any combination of sterling silver, gold, palladium or platinum.